Darren Appleton once again proves he belongs among the game's elite ... and in the Mosconi Cup. Appleton (above) cruised to his biggest win on U.S. soil with an 8-4 victory over Nick van den Berg. TO BE sure, Matchroom Sport-produced events, like the recent World Pool Masters in Las Vegas, are the envy of all professional pool players. From the emotion-flamed Mosconi Cup, to the World Cup, the World 9-Ball Championship and World Masters, lucky participants continuously brag about the rock star treatment, healthy paydays and international television exposure that comes with an invite to a Matchroom competition. Conversely, those players on the outside looking in often spend their time pleading their case, posturing and politicking for a seat at the TV table. 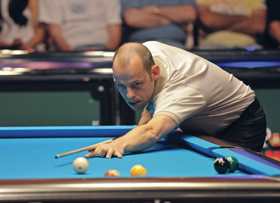 Just ask Englishman Darren Appleton, who thought his march to the World 10-Ball Championship in October had cemented his spot on Europe's 2008 Mosconi Cup squad. "I was sick last year when I didn't make the Mosconi Cup team," remembered the 33-year-old English 8-Ball transplant. "I had already won the Derby City straight-pool title, a EuroTour title [the Italy Open] and was moving up the rankings." In the end, though, the snubbing simply steeled Appleton's resolve. "I decided that I was willing to wait my turn," he said. "But it gave me even more commitment to make sure it was impossible for me to be left out this year." While Appleton will still have to perform with consistency throughout 2009 to earn spots in the World Cup of Pool (a two-man team event) and Mosconi Cup (Matchroom has already announced that there will be no World Pool Championship in 2009), his win in the recent World Pool Masters should go a long way toward inclusion in both. The diminutive Brit outlasted a formidable field of 16 handpicked champions, including four members of Europe's 2008 Mosconi Cup squad, to hoist the World Masters trophy and snag the $20,000 top prize in his first ever Matchroom appearance. "We all want to play in Matchroom events," said Appleton after outlasting Holland's rejuvenated Nick van den Berg, 8-4, in the title match. "To win in my first appearance is unbelievable. My goal is to be in the Mosconi Cup. Hopefully, this helped my chances."